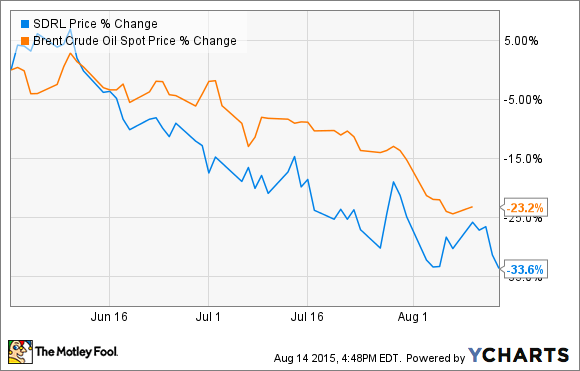 Oil is hitting this offshore drilling stock hard. What: Shares of Seadrill Ltd (NYSE:SDRL) have plunged an incredible 33.6% since the summer began, and with a P/E ratio under 3.0 the stock may now look like a value to investors. But before jumping in you need to know why the stock is down in the first place. So what: The biggest driver of Seadrill's decline is the plunging price of oil, which has an indirect effect on the company's operations. Since oil started to fall last summer the offshore drilling market has slowed dramatically, and deepwater drilling, where Seadrill has positioned its largest investments, has ground to a near standstill. What's interesting is that this slowdown hasn't yet begun to impact earnings. Seadrill has reported better than expected earnings the past two quarters (second quarter 2015 isn't out yet), and for the full year analysts are expecting a $2.30 per share profit. But projections of what could happen in 2016 and beyond have investors selling this stock at a rapid rate. Now what: If you're looking for a leveraged way to play oil prices then Seadrill is it. And I give the stock a solid chance of making a recovery as the offshore drilling industry adjusts to the new market conditions. Seadrill has one of the youngest fleets in the industry, and as explorers ponder whether or not to pursue offshore fields they'll look for rigs with greater capabilities and higher returns from the dayrates they pay. That'll make newer rigs more desirable, even if they have to accept lower prices in the process. This is a high risk/high reward investment, but I'm not giving up on this leading offshore driller. The oil industry, whether it's onshore or offshore, won't likely be able to sustain these low prices for long, so I think the bottom is near for Seadrill.